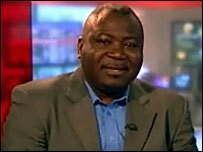 Those spoilsports in the Immigration Service must have jumped when they saw the BBC's "Wrong Guy" Guy Goma being interviewed in place of Guy Kewney. Just as they did with former Big brother housemate Makosi - they heard the accent and jumped onto the database, checking the legality of his UK residence. It turns out, that (again, like Makosi), his status in the UK is questionable. It is being reported now that Goma is in fact an illegal immigrant from the Congo, who overstayed his tourist visa and decided to apply for a job with the BBC. Of course, the rest is history. Goma is not just some schmuck off the streets though (nor is he a cabbie, as first reported) - he has a Masters degree in Business! So, although his English wasn't all that great, you can see from his TV appearance (which, incidentally, has been downloaded more than 1.6 million times according to the Mail on Sunday), he could at least bluff his way through the interview. Goma had become an overnight celebrity (once more, like Makosi), and planned to capitalise on his new-found fame. However, it looks like that fame will now be short-lived (where do the parallels with Makosi end? ): Immigration want to deport him back to the Congo. Londonist feels that, in the spirit of fairness, Guy Kewney should be sent to the Congo, whilst Goma takes on Kewney's job instead. Now THAT would be a fitting end to the story. That or Goma should find the Big Brother golden ticket.